In this category we like to talk about the settings how we have been keeping our boas successfully in the past. We´re aware that there are many different other ways and setups to successfully keep boas, but this is how we made the best experiences. Of course we´re constantly improving our husbandry and are always looking for ways to improve our setups so feel free to let us know what you´re experiences are. We´re heating our whole facility up to 27 degree Celsius (That’s 80,6° Fahrenheit), inside the cages we have temperatures from 27 up to 31 degrees by offering a heating mat on top of the bedding which allows the animals to heat up if they like to. 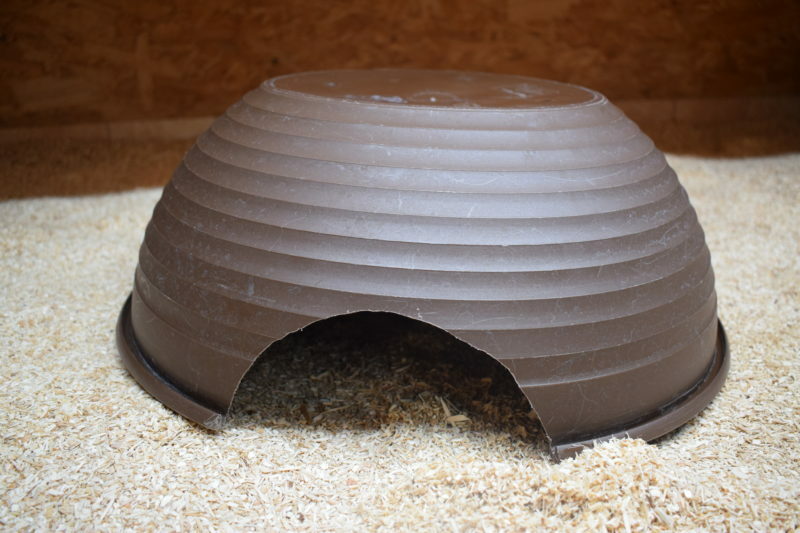 According to our experience these heating mats are only used frequently by pregnant females to regulate their body temperature and from time to time if they´re digesting a larger meal during winter time when the night temps can be down to 22° Celsius. No matter if we talk about our cage or rack temperatures, the heat is turned off during night times but we´re ensuring that the temperature doesn´t drop below 24-25° Celsius within our baby racks and 22° Celsius within our cages during breeding season. Because we´re heating the whole faciliy our experience is that the temperature doesn´t drop that fast once the cages are turned off and we don´t have to pay attention to that, we get hardly below 24-25° except of the winter days. But you have to pay more attention to it if you´re having a single cage within your living- or bedroom and should always use a thermo control unit to avoid a rapid temperature drop during night times. Several digestion and health problems in general can be avoided if you´re not only keep an eye on day temperatures. The heating mats are running the same amount of time like the lights are on which is from 6am till 7pm and both are switched off during night times. Only for pregnant females we´re offering heat mats during night times as well. As bedding we´re using a soft wood granulate called “Tierwohl Super”, originally produced for horse boxes. To our knowledge it´s available in many European countries. It is dust free and is perfectly able to keep moisture, but isn’t molding quick on the other hand. It´s available in 25kg bags which comes handy if you´ve big enclosures to fill. We´re raising our baby boas in racks where we´re using newspaper as substrate which is working perfectly for us. Talking about moisture, we´re spraying water like 1-2 times a week or more often if necessary (mostly during dry winter weather) to keep the humidity at 55-65%. Lot of people think the humidity always needs to be around 80% which has several disadvantages at once. First of all a high humidity, as well as too low, can cause respiratory infections but also your bedding can start to mold. You should always allow the bedding to “dry” again (not less than 50% humidity) before spraying water again. Of course it does no harm and is usual that the humiditiy is rising up till 80-90% directly after water has been sprayed. Within our rack systems we made good experiences that spraying isn’t necessary at all as long as you provide a good sized water bowl and the ventilation holes aren´t too big to keep the humidity. Only for babies in deep shed the newspaper they´re sitting on is soaked a bit in water to support their shedding process. Please note, every setup is different and you need to figure out what works for your setup at your place! In general, boas aren´t known for bathing except you´re not providing a proper hiding place or they are suffering of a mite affection. It is very important to have a good sized hiding-place that fits the size of your animal. A good hiding-place is just as big enough that the animal fits in. Pretty often it can be seen that very large (compared to the snake) hiding places are offered to let space for the animal to “grow” inside of it. The animals are feeling insecure in these kind of hiding places and will most likely look for another hole they hardly fit in or they cover themselves in bedding. For our big cages different sized flower pots out of plastic are used where just a whole as entry has been cut in. In our baby rack systems we´re using the following hiding-places basically containing out of kitchen bowls with a hole drilled in. These hiding places have several advantages especially when you´re trying to feed the boas for their very first time. 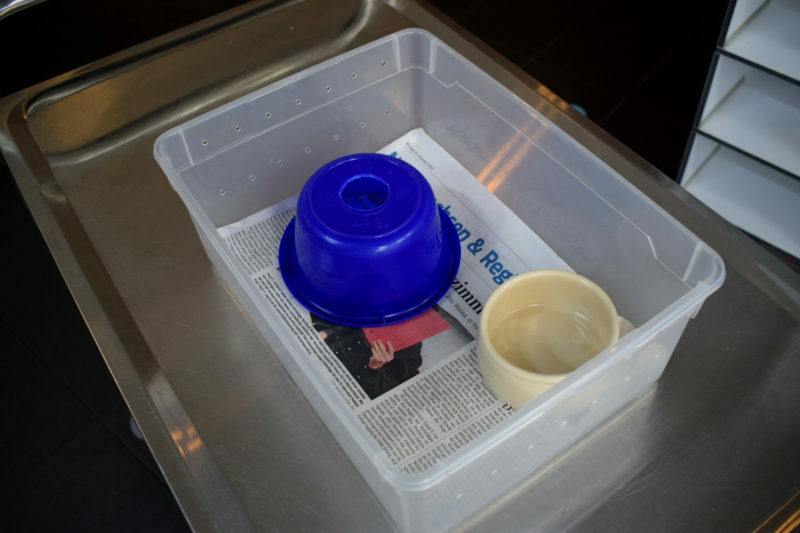 Typically the first time boa’s don´t take the thawed mouse straight away from your forceps, so we´re placing the boa and the thawed mouse under the bowl and cover the hole on top with the water bowl. In most of the cases we´re just leaving them alone like this overnight and it works successful in most of the cases. If this method doesn´t work either and you´re forced to feed live prey our bowls come handy again. Again, we´re placing the boa under the bowl and put a hopper mouse outside in the rack box. (Always move the water bowl more to the center of the rack to avoid that the mouse jumps in and gets drowned). The advantage of the hole on top of our hiding place is that the mouse isn´t able to “overrun” the boa. Especially boas that reject to eat the first times are kind of “shy” and a mouse jumping on their back isn´t helpful at all to make them want their first meal. However, the boa can come out of the bowl and lay down on top of their hiding place and take a closer look at the mouse without being overrun or even worse getting bitten. With this method we´re successful get even the worse feeder to start feeding. We´re constantly working to extend this category and will keep you posted in our Blog if a new topic has been completed. Feel free to let us know what else you like to read about here.